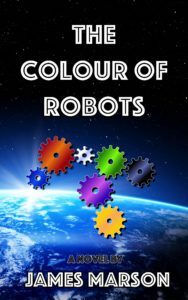 The Colour of Robots is James Marson’s first novel. It’s a science fiction adventure with a touch of humour. It is a hundred years since the War with the Robots and the universe is a much safer place thanks to the Empire’s ‘Anti-Robot’ directive outlawing anything with more artificial intelligence than that required to operate a dustpan. So it comes as something of a surprise to junior planetary engineer Karl Dougan when he discovers two fully-functioning, supposedly long-extinct robots on a remote planet. James Marson combines his love of humour, science fiction and adventure in this debut novel suitable for readers of most ages and fans of sci-fi and general fiction alike. It can be bought (or read for free if you’re an Amazon subscriber) here. If you’ve already read it ….please, please leave a review…!